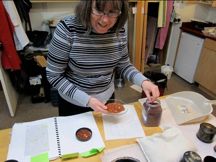 For the next two weeks my website will feature a blog on recreating western lacquer surfaces using historic recipes. This project came about because Jonas Veenhoven is doing an internship with me to study western lacquer. For students to get a better understanding of the complexity of the finishes I usually have them make sample boards using 17th and 18th century recipes. Since Jonas is doing a short intensive internship we thought that we would take the opportunity to share this experience with others interested in the subject. Jonas will do most of the writing and photography and I will occasionally add my comments on my previous adventures in creating western lacquer. Salmon, William. Polygraphise, or the arts of drawing, engraving, varnishing, Japanning and gilding. London, 1672, 1685, 1701, 1735, 1778, 1781. Parker, George and Stalker, John. A Treatise on Japanning and Varnishing. London, 1688; reprinted in1960. Dossie, Robert. The Handmaid to the Arts. London, 1758, 1764. The reason for this research is mainly to understand what the problems were in creating these western lacquers, which had to compete with the Asian lacquered objects. The total procedure will be documented on this blog and hand written on the back of each sample board for future reference. All of the original recipes call for large quantities for example dissolve 1.5 pounds of seedlac in a gallon of spirits(ethanol). We will be using for all of the recipes a 20% solution with some exceptions because of the size of our sample boards and precious materials. For this research we will be using sample boards made of poplar plywood. The sizes of the sample boards are identical to each other (6cm x 18cm). First the sample boards were sanded starting with sandpaper 180 and later with 240 sandpaper, moistened and sanded again to remove the raised grain (p400 sandpaper). The following step was to apply three isolation layers with a 6% rabbit hide-glue. After this the gesso was prepared using 6% rabbit hide-glue, with calcium carbonate (CaCO3). First one coat of gesso was applied, dried, and then sanded of after drying with p400 sandpaper. Two more coats where applied and sanded again after drying with p400 sandpaper. The sample boards had to be divided into two groups. The first group to be used for light coloured lacquers like blue, white or yellow. An opaque preparation was needed with the grain completely filled. The second group used for the dark coloured lacquers need less layers of gesso. The grain had to be completely filled but the figuration of the wooden substrate still visible. In total three layers of gesso where applied. The dark coloured sample boards needed six layers of gesso. The final sanding procedure was done with p800 sandpaper on both groups of sample boards. For recreating this lacquer one has to be furnished with eight different resins which al have to be dissolved in alcohol. The gum animé can historically seen be a confusing. The name was known to denote several different resins. 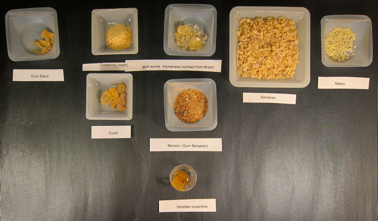 To know which specific resin is used in an historical recipe it is important to know the exact context of the recipe. 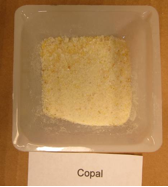 Mostly a Copal resin is needed but there are several other resins, which are known under this name. When we look to the exact context of this recipe we know that all of the agents are dissolved in alcohol. In this context it could be a soft copal resin. There are several other names known under gum animé like West Indian animei or Tacamahac resin, which comes from the Calphyllum (Guttiferae). Another form is known under demerara animé, this is a South American Copal coming from the Hymenaea courberil. For the Stalker and Parker white varnish like mentioned above we used the Hymenaea courberil from Brazil because it is used in an alcohol varnish and the recipe just needs a soft copal resin. On the other hand lacquer artists did not know exactly what they where using since they never saw this tropical plants where these resins came from. Also different names changed over time. First all the resins where weighted and measured (fig. 1). 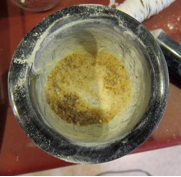 After this the Hymenaea courberil, Copal (we used Manilla Copal in this recipe), Rosin and Benzoin where pounded into fine powder before they where dissolved into their bottles of alcohol (fig 2,3,4,5). The other resins needed no further preparation and could directly be added in their bottles filled with alcohol. In total there where four different bottles used filled with alcohol and resin. 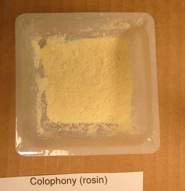 The first bottle was filled with the Copal, Rosin and alcohol to dissolve them (fig 6). The second bottle was filled with the Hymenaea courberil, Benzoin, Venice turpentine and the alcohol to dissolve them (fig 7). The third bottle was filled with the Sandarac, Mastic and alcohol to dissolve them (fig 8). The fourth and last bottle was filled with the gum elemi by itself and alcohol to dissolve it (fig 9). All the bottles had to be shaken approximately once in the two hours, like recipe says “make them dance and change places”. fig. 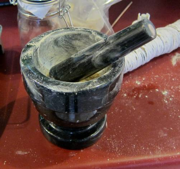 2,3 pounding the Benzoin into fine powder. fig 7. Gum animé, Benzoin, Venetian turpentine in alcohol. For this recipe today only the Saffron coming from the Crocus sativus was prepared because this dye has to be soaked in alcohol for 4 days. We used for this recipe 10% of the amount needed in the original document. First the Saffron was weighed and measured and put in the alcohol (fig 10). This strong and precious EUR 773,50/ CA$ 1044,011 (100gr) dye directly shows a yellowish colour in the alcohol solvent (fig 11). The first thing we did was to pick out the lightest Seedlac pieces and leaving the dark coloured parts behind to obtain the highest quality varnish. This is a very time consuming work but is needed to obtain the best seedlac varnish (fig 12).